The Arena Garden of Toronto. 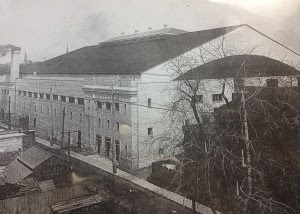 Hello Again, whilst researching for a book i am writing i came across this little article in a Winnipeg newspaper from 6/12/1912 it reads: RINK OPENING IN TORONTO DELAYED. An ice making expert W.J. McGee arrived from New York Monday and after a thorough examination declared that the piping at the Arena would all have to be taken up and relaid. This meant that the ice already formed would have to be thawed out and hot water was forced through the TWELVE MILES of pipe with that end in view. The pipes will have to taken up and relaid properly. This will delay the skating and hockey practices for another week at least. 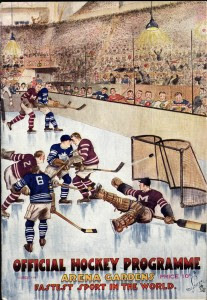 Right: This is the programme from the final game at the Arena Gardens in 1930 Toronto Maple Leafs vs Montreal Maroons. My love of hockey started many moons ago, I suppose my brother David is to blame, he used to take me to watch football first and Sunderland were our team, after the game we headed back into town to the leisure centre and watch some Ice-hockey. The home team were the Crowtree Chiefs and one of my first games were against the Billingham Bombers it was a local derby and quite a feisty game I remember. Although I seemed to enjoy watching the Chiefs I definitely saw a big difference in quality when we visited our other local team the Durham Wasps (O`Conner, Brebant, Smith`s, Crapper etc....). The best matchups had to be against the Whitley Warriors many a time we went to see a fight and a hockey game broke out. These were memorable times and i loved travelling around the country visiting other rinks. But my love for the game cranked up a gear when Channel 5 started televising live NHL games. I was in total awe of what I was seeing, so began my fascination for this breath taking sport. I had to find out more about all of the different uniforms, logos and nicknames. I have read masses of books and magazines and will not be getting involved in where it began or who started this game. I am interested in the hockey logo and what it represents to the fans that follow it, hence the blog. I wanted to show people the interesting logos and try to find out about other ones that could end up lost through time.